GardenSmart :: ARTICLES :: Dreaming of Spring- Plan Your Outdoor Updates Now! GardenSMART :: Dreaming of Spring: Plan Your Outdoor Updates Now! 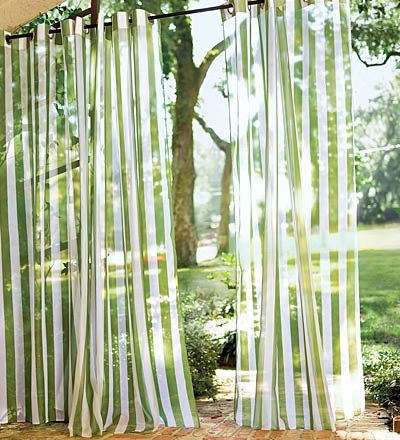 Dreaming of Spring: Plan Your Outdoor Updates Now! Who’s ready for spring? We are! After months of winter blahs with short days, cool temps, and long nights, it’s fun to think about sunshine and new growth. While it’s still cold and the ground is frozen in some climates, here’s what you can do now to make the most of spring’s pending arrival. It’s as easy as 1,2,3! 1. Rethink your outdoor living space. Even if warm weather hasn’t arrived yet, this is a great time to make a plan for how to best enjoy it. 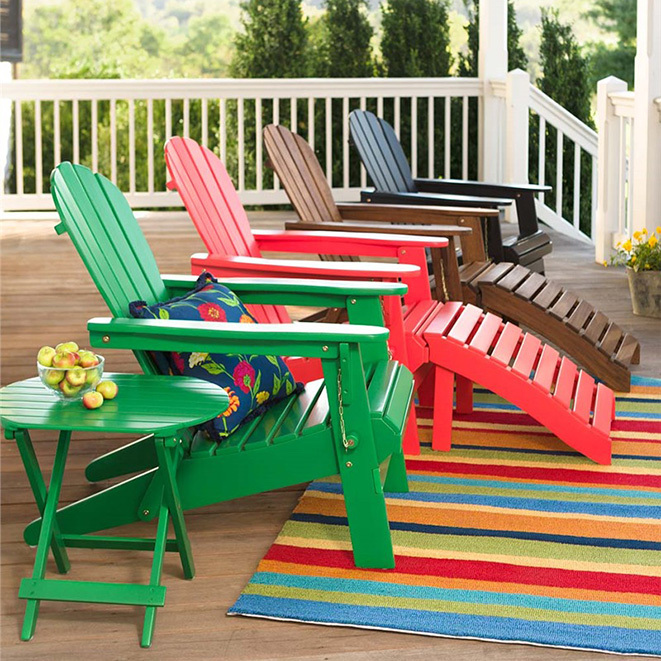 Take a look at your outdoor furniture. Is it working for the way you live today? If you’d like to make a change, take a look at your options (from the warmth of indoors) and decide when you’d like to have your outdoor space ready. If you’re considering any custom options, such orders may have a long lead-time, so now may be the perfect time to put in your request. So let’s talk about some potential changes! If you’re still sitting on hard metal chairs outside, think about an upgrade to something that feels just like your living room. Deep seating that withstands the elements is a great investment; it’s like getting an addition to your home for a fraction of the cost. If your furniture is functional but getting a little tired or worn, you can get a quick, colorful, and inexpensive update with new cushions and possibly an outdoor rug. 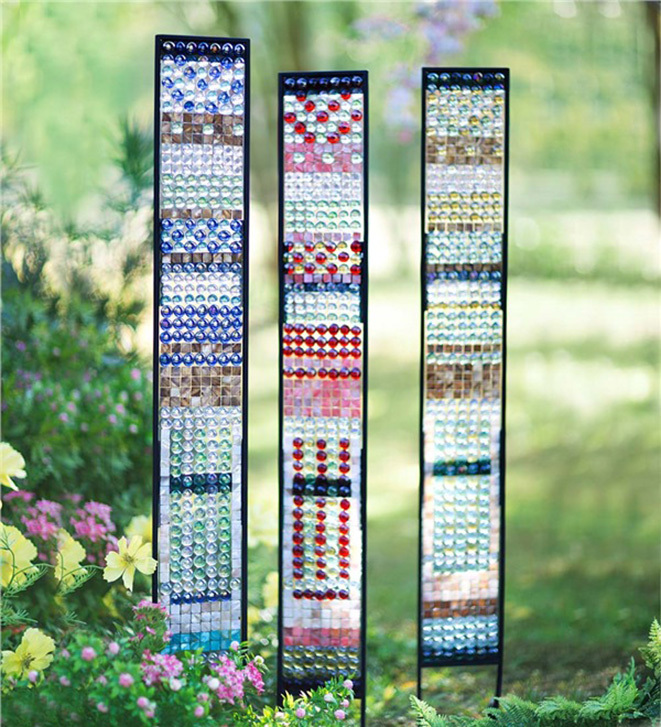 You can also define spaces with intricate trellises and add brightness with colorful planters. Start looking now and begin purchasing homes for those pretty spring flowers and climbers. If you’re looking for the latest trend in outdoor entertaining, many people are now creating entire outdoor rooms, complete with fire pits for warmth and ambience, rugs for softness and color, outdoor curtains for definition, and even additional outdoor lighting. 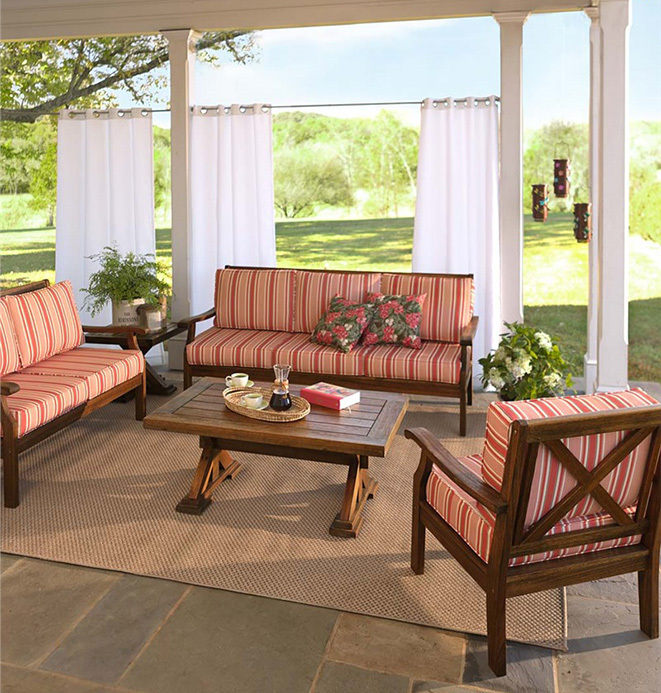 Pulling together an outdoor room this way makes you feel as if you’ve gained square footage in your house as well as a welcome retreat to encourage relaxation. TIP: Now is a great time to check your furniture covers, if you have them (and consider buying some if you don’t). Repair or replace any covers that have ripped in the winter wind or have rotted seams thanks to snow and rain. Outdoor furniture lasts much longer when protected from moisture, sun, and pollen – and don’t forget about your grill and planters, too. 2. Decide where and what to plant. Decide now what you’ll plant this year. Will it be decorative annuals in the flowerbeds? Tomatoes and veggies? A kitchen herb garden? Will you start from seeds indoors or buy seedlings? You can plant seeds indoors anytime, or consult your local nursery for guidance on ideal times to plant outdoors in your area. If this is the year you’re finally going to start a garden, now’s the time to decide where it’s going to go, how large it’s going to be, and what type of garden you want. You can design your own raised garden beds of any size to work in your space with your own lumber and steel corner braces to hold them together. Some people till the soil first; others make deeper beds and plant on top using topsoil. If your gardening ambitions are sometimes derailed by other priorities, consider some easier options. You can plant an herb garden on your deck or balcony and ease the strain on your back with raised planters. 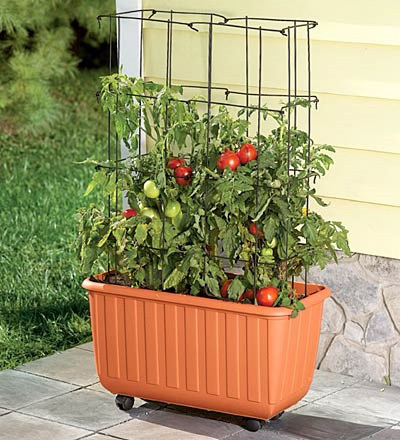 You can yield a surprising number of tomatoes with a self-watering rolling tomato planter, too—and the portability advantage means it’s easy to relocate for the best access to sunshine. Tomatoes on a trellis can bring up to 20 lbs. of fruit per plant, plenty for an average household. 3. Plant some color right now, even if it’s freezing outside. 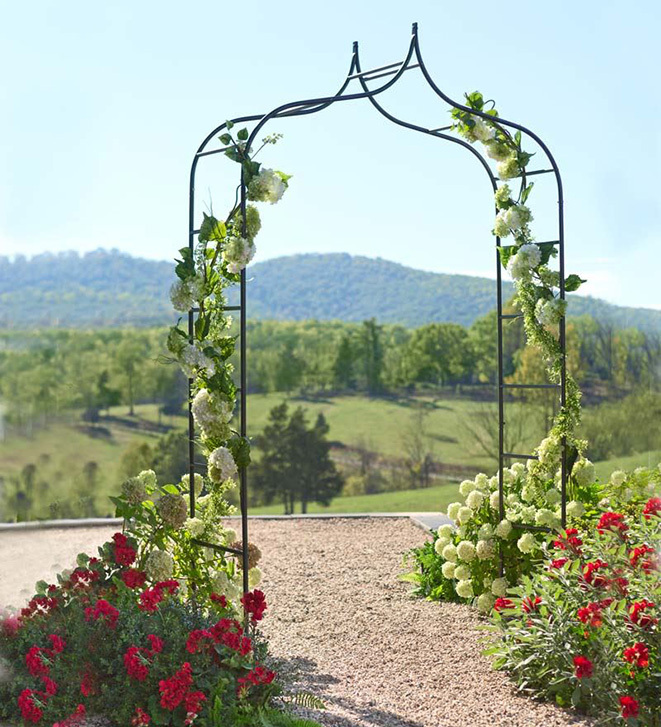 An arbor makes a stunning and dramatic entrance to a garden or path, and it looks elegant with or without climbing vines or flowers (including in the snow). Spinners come in all shapes, sizes and colors. 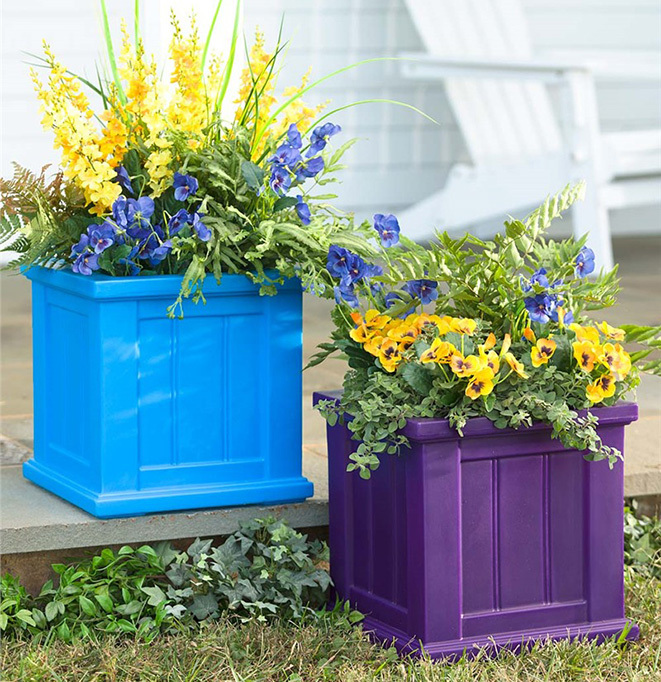 They’ll look especially fun in high March winds, and they’re bright and cheerful all year long. 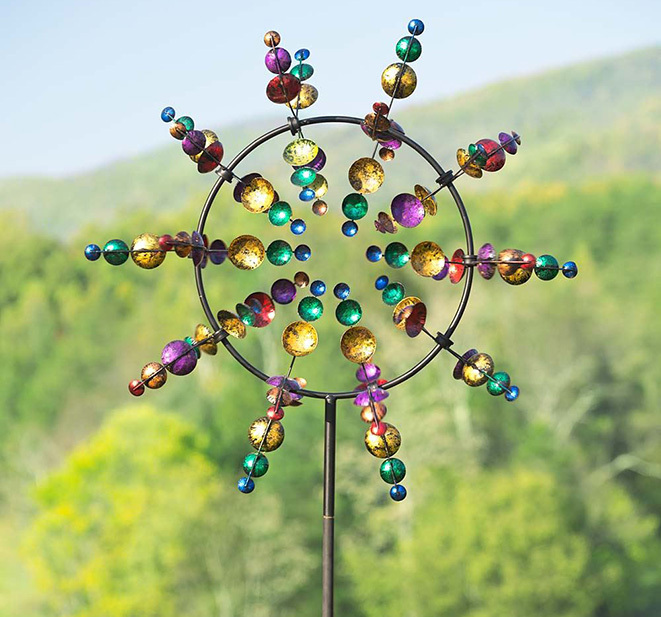 There are even solar spinners that light up at night, offering visual interest after dark. If you like a touch of the unexpected, add colorful garden accents that match your personality, from cute to quirky or whimsical. Many of us may still be dealing with snow, ice, and whipping winter winds, but it’s never too early to dream of sunnier spring days! Whatever your outdoor goals are this year, you can start your spring warm-up now. For more information, visit Plow & Hearth.